“I’ll see you tomorrow morning,” Sarah’s mother shouted from the driveway. This is the first time Sarah was invited to a slumber party and not just any slumber party, but one hosted by, Jennifer, the most popular girl in sixth grade. Sarah desperately wanted to fit in, after all, she was turning twelve next month. I’m practically an adult, she thought to herself. Jennifer greets Sarah at the door and leads her down the stairs to the semi-finished basement of her two-story home. Four other girls in her class wait on an area rug tucked away in the corner. The basement was dark, dank, and kind of creepy. As night descended upon them, the slumber party went from makeovers and chick flicks to something more adventurous. “Ever play Moldy Mary?” Jennifer asks Sarah with a devilish glint in her eyes. Sarah never played, in fact, she never even heard of the game. Jennifer turns off all the lights in the basement with only a flashlight illuminating her face. She goes on to explain that about a year ago, a neighbor named Mary was left home alone, her husband was out-of-town, and her children were at a neighbor’s house for a sleepover – much like this one. No one knows exactly what happened, but Mary was found in a flooded basement surrounded by spiders. It was later reported that she suffered from shock and an undisclosed illness due to prolonged exposure to Black Mold. Jennifer tells Sarah that she gets to play the game first. All the girls giggle with anticipation. Jennifer instructs Sarah to go into the small, pitch black bathroom on the opposite side of the basement. Once in the bathroom, she’s to chant “Moldy Mary” three times and wait to see what happens. Moldy Mary! Moldy Mary! Moldy Mary! Suddenly, to Sarah’s horror, a woman appears in the mirror dripping wet. Her runny nose, skin rashes and obvious disorientation are so shocking, that Sarah flees from the bathroom, up the stairs, and out the front door! Sarah’s story is only fiction, but the effects that black mold has on the body are very real. Stachybotrys chartarum, or black mold, is a microscopic organism containing enzymes and spores that are in charge of digesting and decomposing organic materials, as well as, reproduction. Black mold is extremely toxic and causes serious symptoms and health issues. These symptoms include mental impairment, breathing problems, internal organ damage, and sometimes even death! Finished concrete basements that haven’t been thoroughly waterproofed are extremely problematic. 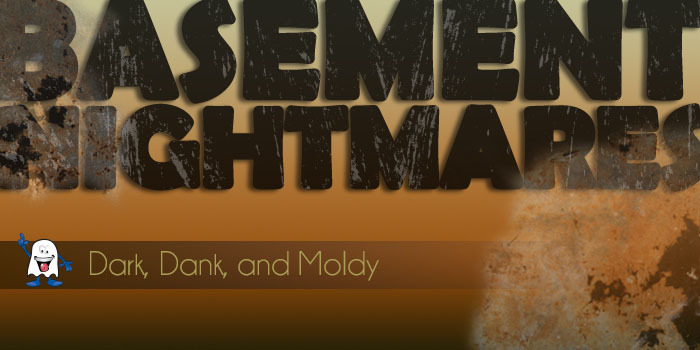 When moisture migrates from the ground to non-waterproofed basement walls, mold can start to grow almost immediately. Foundation leaks, high interior humidity, overflowing washing machines, and sewage back-ups are common sources of moisture. Black Mold is Hazardous to Your Health! Since many of these ailments mimic flu-like symptoms, patients are often misdiagnosed by medical professionals. Seal off the area containing mold spores by covering the opening with polyethylene sheeting and duct tape. Make sure to work slowing and methodically, so that you don’t stir up additional spores. If your basement is flooded, get it as dry as possible within the first 72 hours, before mold sets in. You can place a box fan in a window with the air blowing outward. Next, spray the affected areas with mild soap solution. You can purchase a spray bottle from your local hardware store and fill it with a mixture of water and dishwashing detergent. Lightly mist insulation, carpet, and other materials before you remove them. Remove any furniture, storage boxes, and other materials. Double-bag the moldy materials in plastic garbage bags. Roll and double wrap carpets. When you’re finished, wash all remaining hard surfaces with a bleach solution and let dry. Don’t Wait for Your Basement to become Moldy; Call Team EverDry Today! Getting rid of moldy materials is just a temporary fix to the overall problem. In order to ensure that black mold will not return, you need to address the root of the problem. If you see water in your basement, chances are, you have a cracked foundation. Don’t wait until it’s too late! Schedule your free 20-point inspection or give EverDry Toledo a call at (419) 841-6055 to get started! Share your basement nightmares with EverDry Toledo on Social Media!